What are your website dreams? We’d love to make them come true. First we need to know a little bit more … we always want to know more. That is because we know that be best website is one that serves your needs – considers your audience – understands your competition – and looks, feels and sounds like …well, like YOU! Your website is often your first impression – before people buy or when someone refers them to you – they check you out. Therefore, your website needs to be great – but it also needs to reflect your business and the customer experience that a prospect can expect. You don’t have a long time to make a good impression – so your website needs to get to the most important points first. It needs to have great headlines and scannable subheads and bulleted copy. It also needs pages that focus on each your products and copy that goes enough in-depth that it will support your SEO for that topic. A website should make people want to call you, text you or chat with you. If a viewer has a questions – they immediately have a way to reach you. Your website needs to capture contact information – so you can continue to nurture relationships with people not quite ready to buy. Do you have more than one product – or multiple concepts that you need to communicate. A web slider is an attention-getting way to do that. Video is a central technology on the web — if you aren’t taking advantage of it, you are missing the medium that speaks to your prospects. When you are thinking about your website, you also need to be thinking about ROI. How can your website help you make money? Let’s talk. How will your prospects talk to you? You need forms on your website. You may need chat on your website. When prosects get their questions answered – they become customers. Please fill out the form below and share your website dreams with us. Filling this out will help us get up to speed quickly – and make our discussions about your website much more efficient! Of course, if you’d rather just sit and talk with us – we are glad to do that. Website Dreams: What do you want your website to do or be? This questionnaire helps you (and me) begin thinking about what your website should be and what type of functionality you need. Do customers come to your business location? Do you have a domain name in mind? What are your primary products? Who are your top three customers? Do you have a branding color-palette and/or colors you use in all your materials? What distinguishes your company from others? 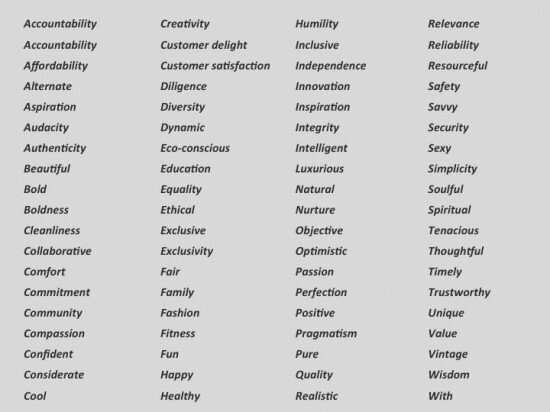 Based on the list below, select 4 or 5 descriptions that describe your company's attitude — and which should be represent you in your branding. Describe the website that you have in mind. How many pages? What are the menu headings? Do you have any special web functionality that you will need? Do you plan to have a blog? Will you sell products on your website? Do you have a few websites that you'd like yours to look like? List them here. Anything else you'd like to say about this website?